Click on any of the images to see larger versions. Sculpted by Sam Greenwell. Pre-solicited; in stores November 13. Baby, it's cold outside...and that's just the way Mr. Freeze, one of Batman's deadliest foes, likes it! From Batman: The Animated Series comes the MR. 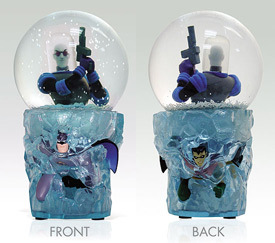 FREEZE SNOWGLOBE, featuring the frost-bitten felon surrounded by snow, in a globe sitting atop a base of ice in which Batman and Robin are frozen. The fully-painted relief sculpts of the heroes can be seen through the 'clear' resin ice of the base. This snowglobe is a hand-painted, cold-cast porcelain statue, standing approximately 7 1/8" tall and 3 3/4" wide. Packaged in a 4-color box. $79.95. Sculpted by Karen Palinko. Pre-solicited; in stores November 6. DC Direct finishes its line of cold-cast porcelain maquettes based on the Justice League heroes as they appear in the exciting WB Animation series on the Cartoon Network! Based on models designed for the series and produced for the artists and animators as the definitive models on which to base their drawings and products, these special maquettes are now available to fans. 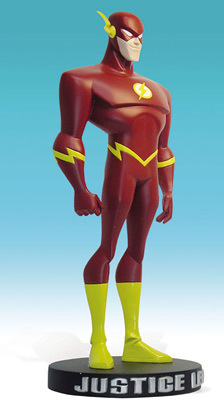 THE FLASH MAQUETTE stands approximately 8 5/8" tall and 3 1/2" wide. Packaged in a 4-color box. This product is being offered simultaneously beyond the comic-book specialty market. $89.95. Sculpted by Tim Bruckner. Pre-solicited; in stores November 6. He's one of Superman's strangest and most enduring foes from the Silver Age of Comics, the backwards-thinking Bizarro! This imperfect duplicate of the Man of Steel, created by criminal scientist Lex Luthor, has all the powers of Superman... and the mind of a child. Now Bizarro No. 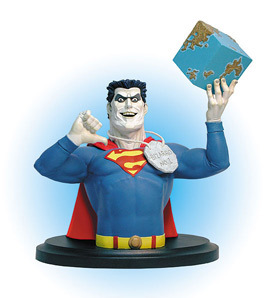 1 ponders the square world that's home to a whole race of Bizarros in the CLASSIC BIZARRO MINI-BUST. This hand-painted, cold-cast porcelain statue measures approximately 6 1/2" tall and 5 1/8" wide. Packaged in a 4-color box. $45.00. Sculpted by Tim Bruckner. Pre-solicited; in stores November 20. 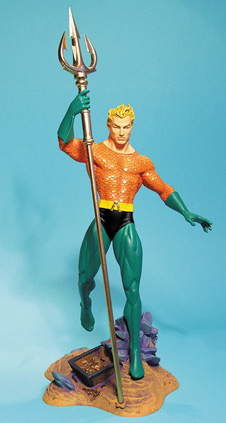 Before becoming the bearded, hook-handed hero, Aquaman long sported his classic orange and green costume. Now DC Direct presents the CLASSIC AQUAMAN STATUE - a hand-painted, cold-cast porcelain statue featuring the King of the Seven Seas as he originally appeared. Aquaman stands approximately 11" tall with base (14 1/2" tall with trident) x 7" wide x 6 1/2" deep. Packaged in a 4-color box. $195.00.